Where social marketers go to get inspired. Speakers include Facebook, LinkedIn, Bacardi, NBC, University of Michigan, American Cancer Society, Peloton, Bombas, UPS, Betabrand, Kuerig Dr. Pepper, Steak-umm, Mailchimp, and many more. Last night Conan O’Brien live blogged his show on Facebook. He posted 96 new status updates to his 1.5 million Facebook fans. His posts garnered more likes and comments than usual, with some updates yielding as many as 1,590 likes and 736 comments. Team Coco was able to build brand affinity on Facebook while growing its fan community. With NewsFeed Optimization each comment, like, wall post and page visit adds to a user’s affinity score for the Team Coco Facebook Page. The higher the affinity score, the more likely the user is to see a Team Coco status update in his or her feed. While it’s evident that some peopledid not appreciate having their Facebook news feeds “gummed” up, as one commenter stated, the campaign resulted in 2,000 more fans from pre-event promotion and 12,000 during and after the live event. Part of this is, of course, celebrity at work. It’s similar to when Howard Stern live tweeted his movie “Private Parts” and it became the top global trending topic on Twitter. How does a brand without a celebrity and primetime TV show achieve Facebook success? People want real-time engagement and the thrill of connecting in the moment. 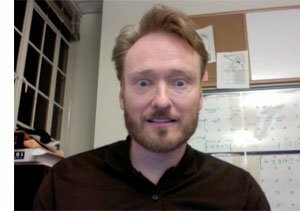 Conan kept his posts interesting by mixing up photo and video posts. Offer your community something unexpected, or provide access to something not usually seen or to a person who does not normally speak publicly. Use your resources. Previously Conan had been more active on Twitter, and with this campaign he became fully engaged with Facebook fans. If you have a large email list or Twitter following, point to Facebook or the platform you are trying to grow. Conan was not just covering his show: he was being himself, being a comedian and sharing with the audience. Make your brand relatable, not untouchable. Some might have felt his “adjust” comment was an over share, but people related and engaged.